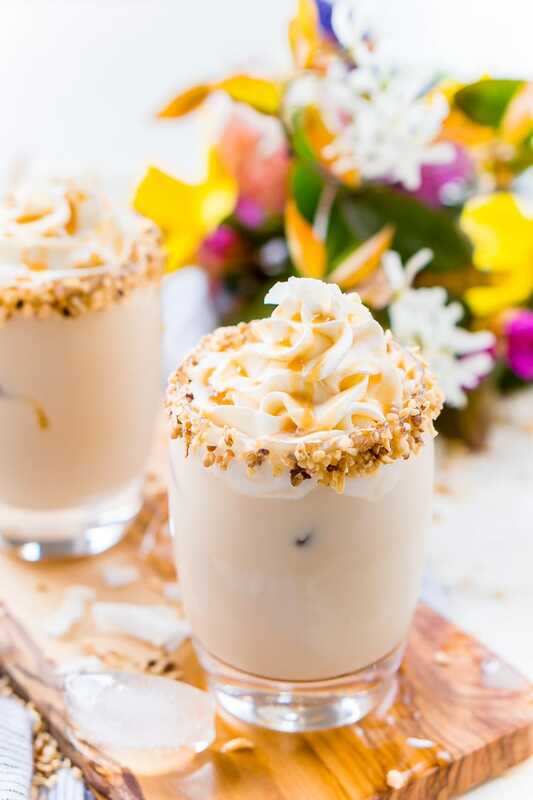 This German Chocolate Cocktail is a sweet dessert drink that’s loaded with coconut, vanilla, chocolate, and caramel flavors! It can be made non-alcoholic too! This German Chocolate Cocktail is a delicious dessert cocktail! Depending on where you are, the weather may have turned warmer weeks ago. But here in Maine, we’ve been dealing with rain, drizzle, and chilly temperatures… until now! Here in New England, as soon as the sun comes out, the locals do too. We play in the sun all day, and as soon as the sun starts to set, we grab our sweaters and head back outside to our Adirondack chairs. And on those perfect summer evenings – which are fleeting but beautiful around here – there’s nothing like having a scrumptious cocktail in hand as the sky turns orange and the peepers begin to chirp. With these memorable nights in mind, I created a German Chocolate Cocktail, an indulgent drink-meets-dessert that’s perfect to sip while gazing at the stars and sitting around a fire pit. This German Chocolate Cocktail is made with a boozy blend of rich chocolate liqueur, milk, creamy Carribean rum, coconut rum, and the star ingredient, Tate+Lyle® Vanilla Cane Sugar Syrup. 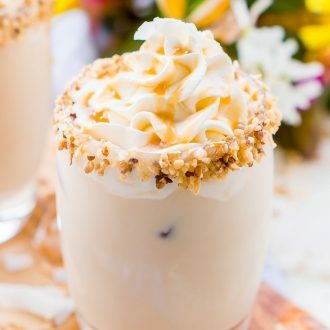 The drink is topped with whipped cream and caramel drizzle, and the rim is coated with caramel sauce, coconut shavings, and pecan pieces. Have youngsters around who want to sip something fancy? Mix up a virgin version with milk, Tate+Lyle Vanilla syrup, chocolate syrup, coconut and rum extracts. Dress up the rim and add a dollop of whipped cream – they’ll feel so grown up! To say this drink is decadent is an understatement, and in case you were wondering, they pair great with melty, gooey s’mores or this German Chocolate Icebox Cake! Every summer, I enjoy creating fun mixed drinks for different occasions, from refreshing lunchtime cocktails to non-alcoholic beverages for backyard barbecues. 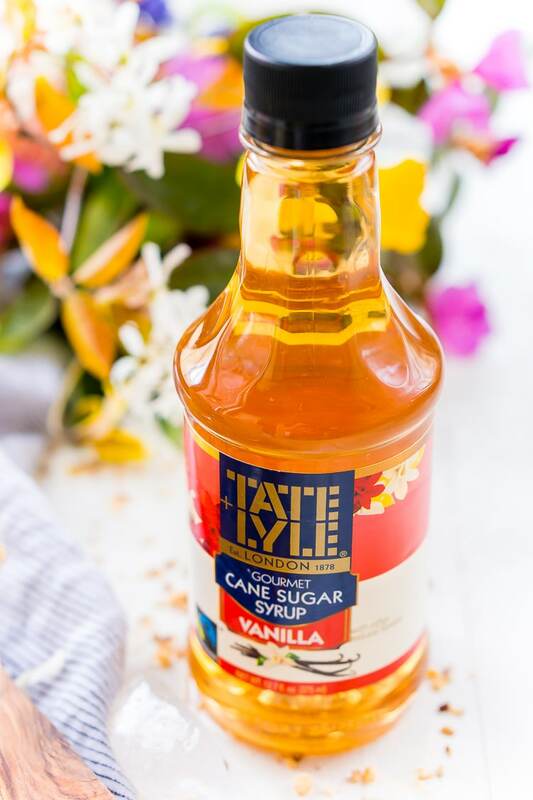 I used to make simple syrup myself until I discovered Tate+Lyle® sugar cane syrups. The different varieties (vanilla, caramel, hazelnut, and zero calorie vanilla) make my concoctions way more interesting, plus they help inspire new recipes. With a quick stir, the syrups blend effortlessly into iced teas, coffees, lemonades, and of course, cocktails! How will you try them out this summer? 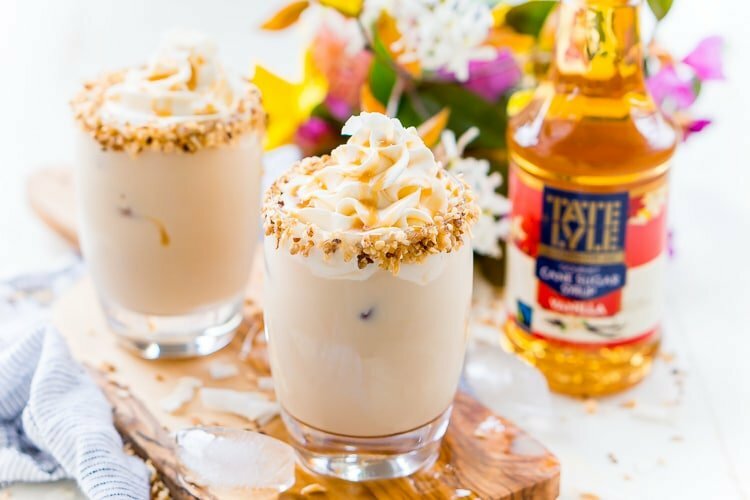 Now that I’ve discovered the quality taste of Tate+Lyle® Gourmet Beverage Syrup (which have been around in the UK for over a century but have made their way to the US), I’ve been using them in place of regular sugar in both drink and food recipes. I feel good about their line of cane sugar products because not only are they delicious, but they’re Fair Trade Certified. This means that they support small-scale cane sugar farmers in developing countries, which helps them support themselves and their families. So, there you have it: these products are sweet in more ways than one. Once you try these easy-to-use gourmet syrups, you’ll be looking for ways to add them to all your drinks and desserts! 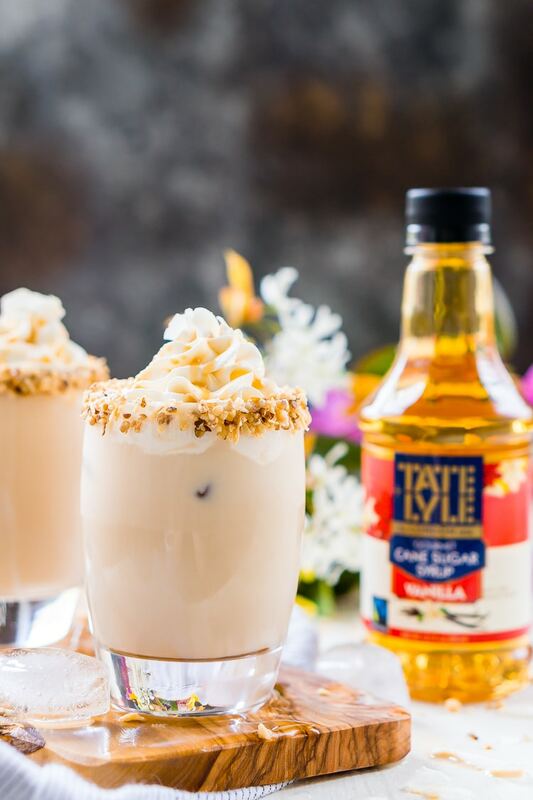 If you love this German Chocolate Cocktail and are looking for more recipe inspiration, check out Tate+Lyle® on Facebook and Instagram for ideas! What’s better than a versatile, Fair Trade product that tastes good and does good in the world? When it’s free! Enter the Tate+Lyle® Perfect Pairings Giveaway on Facebook today! 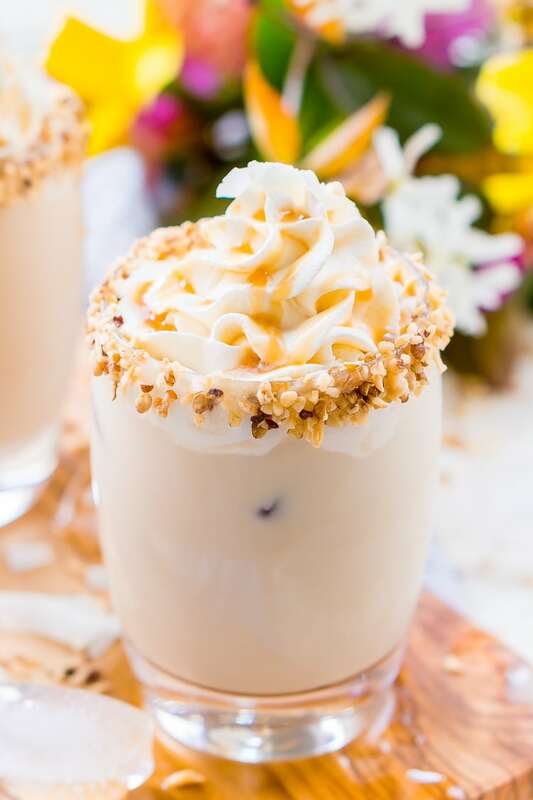 This German Chocolate Cocktail is a sweet dessert drink that's loaded with coconut, vanilla, chocolate, and caramel flavors! It can be made non-alcoholic too! In a cocktail shaker, combine the milk, Tate+Lyle® Vanilla Syrup, chocolate liqueur, coconut rum, cream based Carribean rum, and ice and shake. Place approximately 2 tablespoons of caramel sauce on a plate and lightly dip the rims of your glasses in it (not too much or it will drip). Add pecan chips and coconut to a small bowl and dip the caramel rimmed glasses in it. Pour cocktail contents into glasses, serve with or without ice. This is a sponsored conversation written by me on behalf of Tate+Lyle®. The opinions and text are all mine.